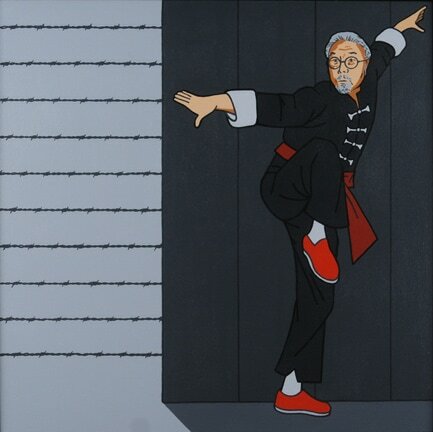 The Flomenhaft Gallery is proud to present an exhibit of the newest exciting paintings by Roger Shimomura. He said of his art, “Central to my work is the manipulation of common objects into something other than what they are.” In fact all of Roger’s art is about Roger and reflects his connection to American Pop Art as he manipulates not only objects but people, sometimes harshly, sometimes with humor. He is third generation Japanese American, known as a Sansei, and he was two years old when his family was taken along with 120,000 other Japanese Americans from their homes, their businesses, leaving all their belongings, and put into Minidoka, one of the many internment camps where they remained behind bars throughout World War II. That experience has lived forever in his memory and has created in Roger a deep sense of empathy for discrimination against any and all races and religions in America. His art is created with a great sense of humanity, reflecting his association with every bias that might threaten our democracy.